It’s my drink of choice. I’ll take it on the rocks, mixed with pineapple juice, in a Manhattan or in one of these Ginger Fizz Cocktails. I’ll find excuses to slip it into whipped cream or cookies. I’ll even find an excuse to put it on vegetables. That’s what you’re currently looking at. 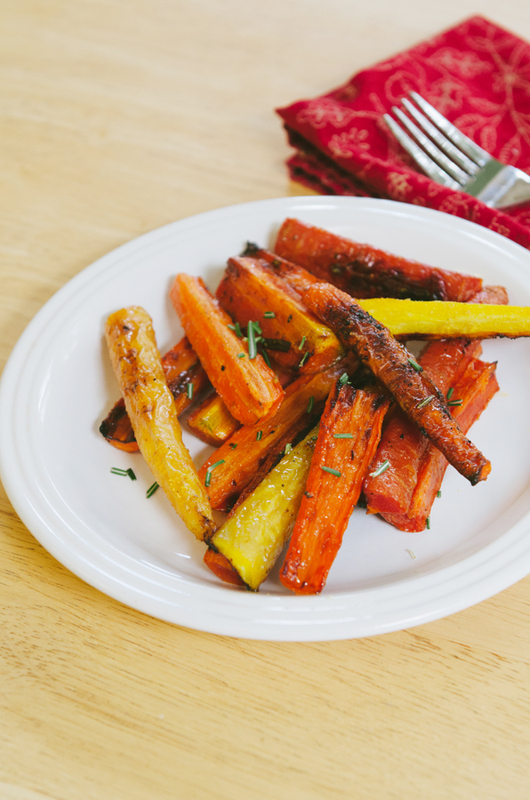 A way of infusing that awesome, rich, bourbon flavor into roasted veggies. I’m realizing now these past few sentences make me sound like a real lush. Ugh. I don’t even know. But, bourbon…let’s get crazy and pour it on some carrots and see what happens. 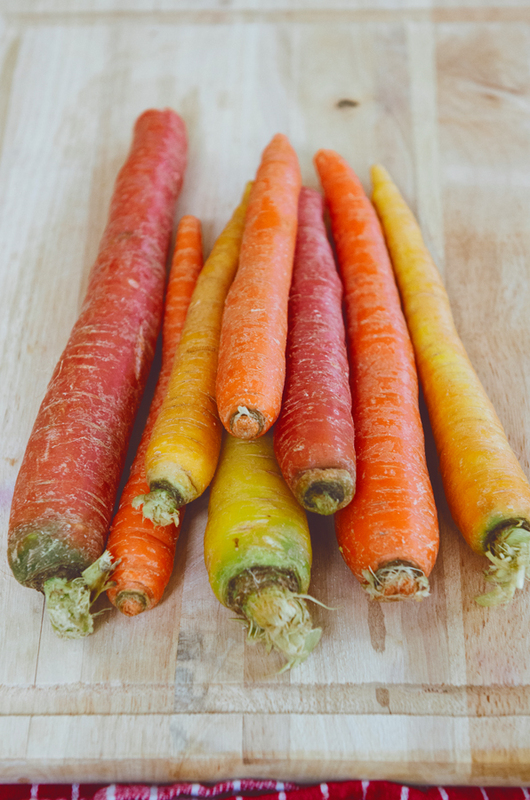 Right now all of those awesomely fun multicolored carrots are starting to appear in markets! This excites me. It feels exotic. When I found these carrots at Trader Joes, I did a little happy dance. My husband simply looked at me, chuckled, and reminded me that I was “dancing over carrots”. Yes, I know. Is there any other way to welcome this caravan of rainbow carrots back into season? I think not. I feel like carrots don’t get enough street cred. We use them all the time. They form the bases of our soups, stews and casseroles. They’re in so many things. But, rarely, very very rarely are they the star! 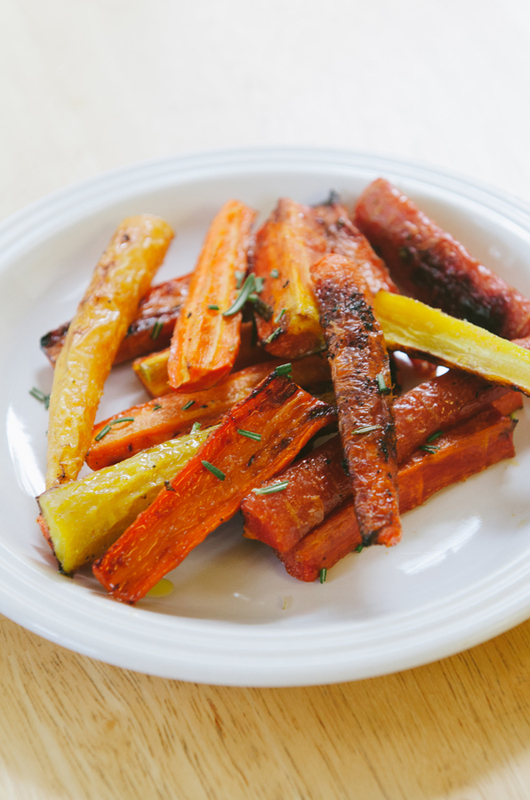 This recipe goes out to that baby carrot with a dream. That teenage carrot that wanted to pack up their bags, ditch the small time and head out to NYC to be on Broadway. That adult carrot that has to stifle it’s impulse for jazz hands just to fit in with the other non-showy carrots. Stifle no more, carrot friends. Crank up the show tunes, put on your top hat and assemble your chorus line. We’re doing high kicks and all eyes are on you. Shine, baby, shine! Okay, so maybe that was a little heavy-handed with the “Carrots go to Broadway” imagery. But, honestly, I’d watch that show over Cats any day of the week. I think we’ve got something here. Does anyone have any Broadway producer contacts? E-mail me. Moving on… What flavors go well with bourbon? Did you say everything? Yes, probably. But, my favorite bourbon pairings come in the form of lemon and honey. Trust me. It makes some tangy sweet magic. You’re going to whisk together your bourbon, honey, lemon juice and olive oil. Create a slurry. Pour it over your chopped up carrots and toss. Lay them out on a baking sheet, sprinkle with some seasoning and herbs and then let them roast until they are all glaze-y. Look at those shiny happy carrots! I had grand plans to put them into a salad. They were going places. They ended up going someplace, alright… but, that place was directly into my mouth. I cut out the middle man, and decided that these things just needed to be eaten hot from the pan with my fingers. I did stage a shot of them on a plate for you though… you know, so you can continue to think that I’m a lady. See? These dressed up carrots would make a killer accompaniment to some turkey and mashed potatoes this Thanksgiving. You could even do as I intended to do and toss them in a kale salad! Dip them in some yogurt! Maybe use them as a swizzle stick in your bourbon cocktail? No. No. Don’t do that. All the other things though. Yes. Wash your carrots well. If you like, you can peel them. I chose to leave the skins on my carrots. 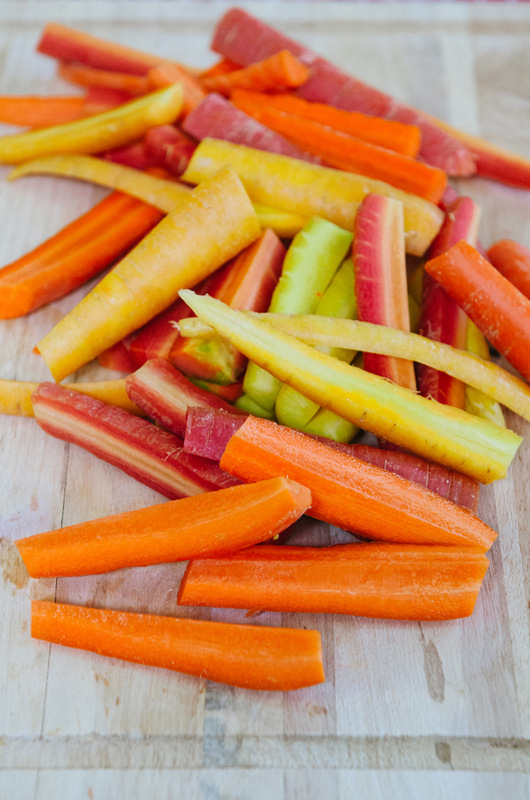 Chop up your carrots into manageable sticks and put them into a medium sized mixing bowl. In a small bowl, mix together your olive oil, bourbon, lemon juice and honey. Whisk until it all comes together. 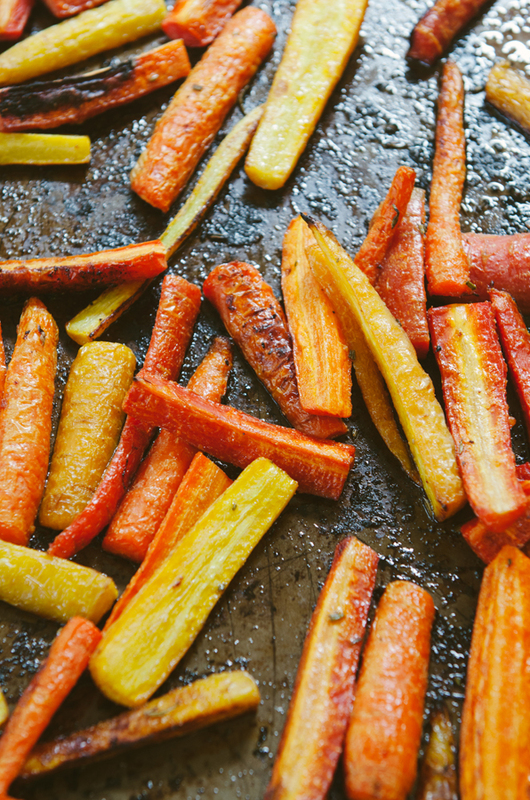 Add your bourbon mixture to your carrots. Using clean hands, toss it all together until all of your carrots are well coated. 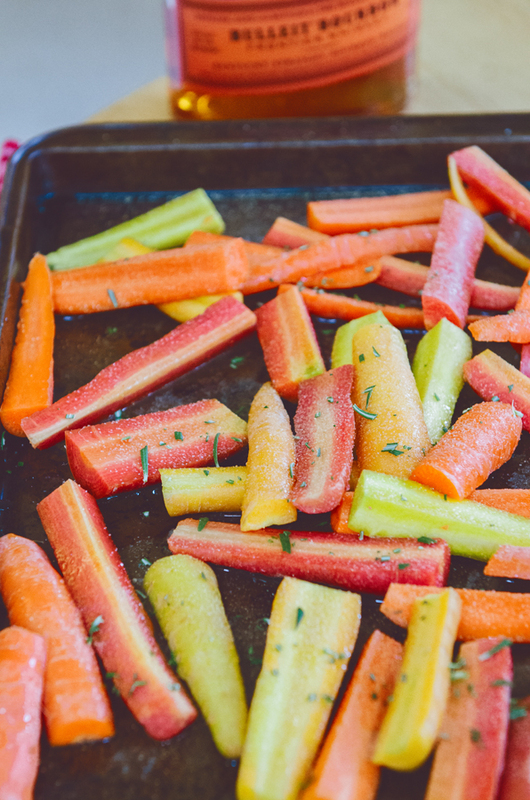 Dump your carrots out onto a clean baking sheet and arrange them so that they are in a flat layer, not overlapping on another. Sprinkle with salt, pepper and garlic to your liking. Sprinkle some of your finely chopped rosemary on top. Roast for 20 minutes. Your carrots will be soft, and have a nice glaze to them. Serve as a side dish, snack, or toss in a salad! Most of all, enjoy! I have a bag of these same carrots sitting in my fridge. (I felt REALLY fancy buying them. What a rush!) I’ve also got a bottle of Bulleit on my counter. Oh! And a lemon asking to be saved from certain death (via shriveling in the sunshine). AND like seven thanks/friendsgiving events I need to cook for this weekend. Goord idear, Gina! I’ve got to try these! But its kinda funny, that as I was reading your post, the only picture that never loaded was the refined, classy, and distinguished pic on a plate! LOL Carry on, finger food! I totally dance over those carrots too. They are always sold out at our Whole Foods! I guess I have to check at Trader Joe’s, huh? And then I too can have boozy pretty carrots. I don’t know about multicolored carrots, I’ll have to check my commuter station farmers market for those, but I’m think parsnips would go really well with carrots in this recipe. I’ll have to try that. This recipe sounds awesome! I, too, am a huge bourbon fan. What are your favorite brands?